UMMU Multi Server (Mac and PC) - available now, here! UMMU Multi Server is now available for Mac and PC! 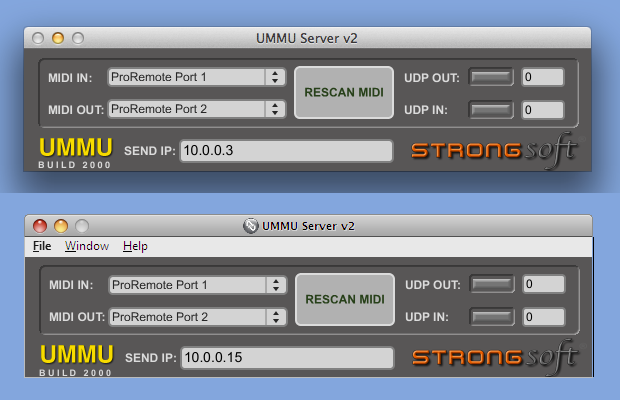 UMMU Multi Server is a Server App which runs on the host computer to enable any of the StrongSoft Remote Apps to remotely control mixing consoles and MIDI-enabled Graphic EQs via WiFi. UMMU supersedes DSMidiWifi for use with these Apps, as it is cross-platform, and supports Mac OSX Mavericks. UMMU Multi allows the connection of more than one iOS device to your console, allowing different users to control the aux send for their monitor mix. UMMU Server v3.5 (Mac and PC) - available now, here! UMMU Server v3.5 is now available for Mac and PC! UMMU Server is a Server App which runs on the host computer to enable any of the StrongSoft Remote Apps to remotely control mixing consoles and MIDI-enabled Graphic EQs via WiFi. UMMU supersedes DSMidiWifi for use with these Apps, as it is cross-platform, and supports Mac OSX Mavericks. Make sure you have the latest version here! (Currently Build 3500 for Mac). New in this version: Now receives Note On, Note Off, Control Change, and Program Change on all MIDI Channels. UMMU Server v3 (Mac and PC) - available now, here! UMMU Server v3 is now available for both Mac and PC! UMMU Server is a Server App which runs on the host computer to enable any of the StrongSoft Remote Apps to remotely control mixing consoles and MIDI-enabled Graphic EQs via WiFi. UMMU supersedes DSMidiWifi for use with these Apps, as it is cross-platform, and supports Mac OSX Lion, and Windows 7. Make sure you have the latest version here! (Currently Build 3000 for both Mac and PC). New in this version: Ability to switch on/off MIDI data types being received by the iOS device. Useful in de-cluttering busy MIDI streams. UMMU Server v2 (Mac and PC) - available now, here! UMMU Server v2 is now available for both Mac and PC! UMMU Server is a Server App which runs on the host computer to enable any of the StrongSoft Remote Apps to remotely control mixing consoles and MIDI-enabled Graphic EQs via WiFi. UMMU supersedes DSMidiWifi for use with these Apps, as it is cross-platform, and supports Mac OSX Lion, and Windows 7. Make sure you have the latest version here! (Currently Build 2000 for both Mac and PC). New in this version: 'Rescan MIDI' button - which means you don't have to relaunch the App if your MIDI World changes. The App now 'remembers' settings of MIDI in, MIDI out, and UMMU Send IP Address. UMMU Server - available now, here! UMMU Server is a Server App which runs on the host computer to enable any of the StrongSoft Remote Apps to remotely control mixing consoles and MIDI-enabled Graphic EQs via WiFi. UMMU supersedes DSMidiWifi for use with these Apps, as it is cross-platform, and supports Mac OSX Lion, and Windows 7. Make sure you have the latest version here! (Currently Build 1040 for Mac and 1026 for PC).